Chris Studabaker showed a screenshot of the original Hotmail in his talk, Lessons from a Low Flying Industry. What was your first email account? I remember having a numeric CompuServe address in what must have been around 1996. I have to echo Jason's sentiments. I had an even more ridiculous hotmail address. It was playah1@hotmail.com . A slightly urban take on my love for computer games or a 13 year old boy that had ideas born in rap videos , you decide. I remember spelling it out in a job interview and having a realisation about how ridiculous it was all in the same moment. I didn't get the job, I did change my email address. My first email address was a shared email address with my brother - bballk911@aol.com. "Bball" because we played basketball (neither one of us was very good, so not sure why we went with that), "k" because we were kids, and 9 and 11 were our ages when we created it. I really upgraded with my second email account - blondi52689@aol.com. My mom now uses bballk911@aol.com as her personal email. Feel free to drop her one - she'll probably respond in about a month or two. Oooo. The "k." Very deep. Beautiful. Mikymania@aol.com. Bigggg Disney fan in the 6th grade. There was a character limit, so, the prospect of typing "Mickey" out in full was quickly destroyed by AOL -- just like everything else. Paul, I don't want to make you feel old but when you had your first email address I was 4 years old. No idea how I bagged that address. Good old Freeserve. Those there the days! The first I can remember was an old yahoo account. Being my first account, it had an understandably terrible address: buddhabass@yahoo.com. I liked eastern religions and playing the bass, made sense at the time. I moved on to AOL not too long after, and that's where 'meladorri' was born, circa 1999. My first email account was a shared family account from a local ISP (ncweb), but the memorable part of that account for me was having to run a 50 foot phone cord from my 28.8 modem and connecting it to the rotary phone in the kitchen in order to check it. Frogwart1@aol.com. Please don't judge too harshly. AOL AIM usernames were plentiful, too. Man, the teenage years were odd. Oh the multiple AIM screen names. I miss SmarterChild! I remember logging into this screen around 1990. 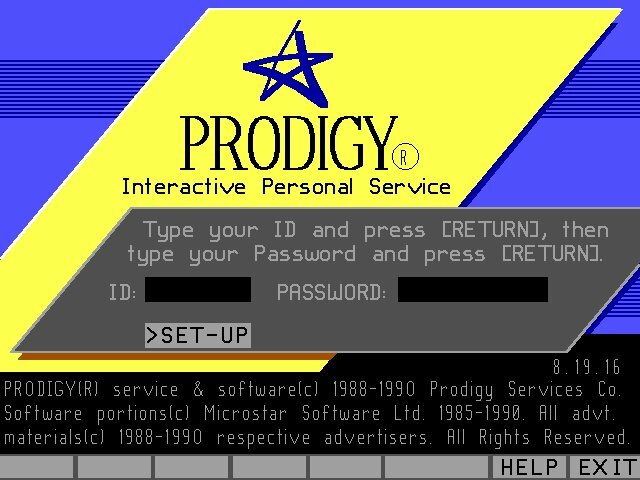 My first "email address" was my Prodigy ID (random numbers) and I remember emailing the only other person I knew online at the time: my dad at the same computer... good times. My first email was at my university and was a boring name one - vewillia. However that name has, somehow, stuck with me through Juno, Hotmail, and Gmail. I think it might be time to make it more interesting - emailluva might be open! vewillia has a nice sound to it. like some sort of vine with flowers. I can't remember exactly, but it was something at some cheap italian ISPs. We had a family email account when we first came online with our outstanding 28.8 kbps modem, but my first personal account was wasted_intelligence@hotmail.com. I can only imagine how much spam is sitting in that account after all these years. I had an email account with Prodigy, but that was only to other Prodigy users. I also had different mail set up on BBSes; back in the day BBSes were part of loose networks like FidoNET, where if another BBS participated, you could mail user@MyBBS and the BBS you were on would periodically dial into other participating BBSes and send mail between BBSes. After that, I had an internet enabled email address via Channel One, a local very early ISP that provided Gopher, WWW, telnet and mail. First generic email was Hotmail. I had sno200@aol.com because I was trying to copy my friend's but couldn't remember the whole thing. I then quickly upgraded to sirstoo@aol.com, despite not being a knight or having the name Stoo. I actually don't even know if that is a name. I then moved on to the more mature ForeverBlue79@hotmail.com - a tribute to my favorite musician at the time, Chris Isaak, and my birth year. Finally joining the community, hello everyone! I had an AOL account in 1994, then had email v-amyd@microsoft.com (contractor) in '95. Quit AOL in '96, then got a geocities account, and then my own domain in 1997. Haha, great thread idea! Mine was mystyk_spiral@hotmail.com because I was a huge Daria fan in 1998. Ahh, memories. I don't remember exactly what the front was, but I'm pretty sure it was at @yahoo. Roughly 1996 as well. I had a vax account in college, which had to begin with 4 random characters and then up to 8 characters of your last name. Mine was 2fb8mcgonega. Thank goodness that system didn't last.